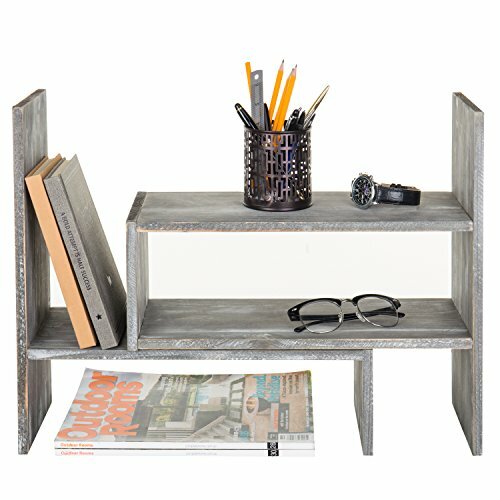 Compact, stylish, and versatile, this adjustable distressed wood shelf is ideal for adding organization and rustic flair to small spaces. This antique-looking shelf is composed of two pieces-one resting on top of the other-that can be fully overlapped to make a shelf approximately 16 inches wide; or pulled apart to nearly double the width. The pieces can also be arranged at an angle to take advantage of unused corner spaces in cubicles or on countertops. Perfect for everything from books or office supplies, to kitchen spices or beauty products, place this convenient adjustable shelf in the kitchen, bathroom, workshop, or office to add needed storage to small spaces. Books and decor not included. Rustic distressed wood adjustable desktop bookshelf organizer. Designed with 2 separate pieces that can be fully overlapped or pulled apart to vary the width to fit various spaces or set together at any angle you choose to best fit your space and your style. Can be used in the bathroom, kitchen, workshop, or office to organize beauty products, spices, tools, books, or office supplies. **Assembly required. ** Books and decor not included. Approximate Dimensions (in inches): Overall - 15.7 H x 30 W x 6.7 D. Width of shelf can be adjusted between approximately 16 - 30 inches.